After years of cooking corn, I found a foolproof method that is incredibly easy, unique and simply delicious. Moving around a lot has created an opportunity to try new things and to incorporate different flavors & methods then I had tried before. Take corn on the cob for example. 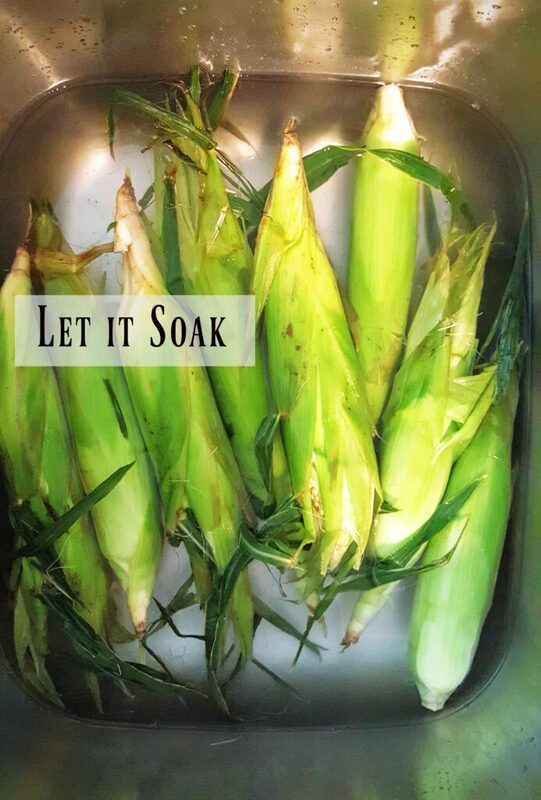 For most of my early years, I remember hanging out in the kitchen, shucking fresh corn with my mom and/or grandma and then adding the cobs to a pot of boiling, salted water. I use to love watching the corn go from a pale yellow to a vibrant hue which signaled they were ready to be devoured. I sure loved corn this way, especially with a big ‘ol slab of butter. After moving to Maryland, a friend of mine cooked their corn on the grill and their special little twist, created the best Grilled Corn on the Cob I had ever tasted (Sorry MOM!). This is now my favorite way to make corn, especially when adding a little Sriracha for heat. 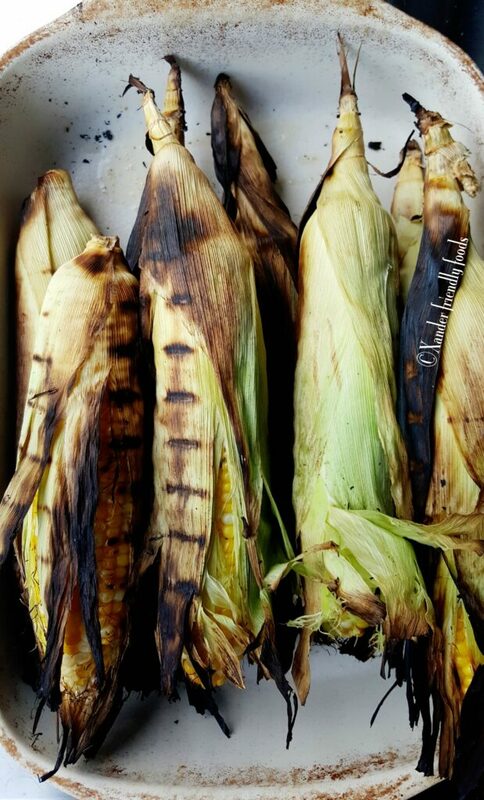 Instead of throwing the corn into a pot of boiling water (where the nutrients escape) or directly on the grill (which can lead to under or over cooking), we’re going to steam the corn directly in its husks and allow all the delicious flavors to remain in tact. We do this by first soaking the cobs. First, pull back the top portion of the husks and remove those little hairs. This will help lessen the chance of them catching on fire while on the grill. Then throw all the corn into a deep bowl or sink and cover with water and let them soak. Throw it all on the grill. Pretty easy huh? You’re still going to want to turn the corn often enough so they don’t burn, but you don’t have to hover, which is why I love this method. Although the outside will be a little charred, the inside will be grilled to perfection. 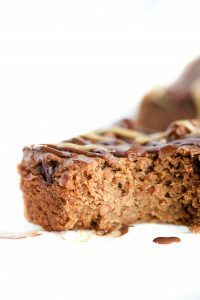 Of course, if you get distracted for a moment or two (like I did), there may be a few that end up blackened on the inside, but it adds character and flavor, so don’t fret! Top with your spicy Sriracha mayonnaise (Just Mayo or Vegenaise) and enjoy! How do you like to “dress up” your corn? Have you tried it with a Sriracha drizzle or do you stick with traditional butter and salt? Do you dive in and eat your corn on the cob or are you more “proper” and cut the kernels off so nothing gets stuck on your teeth? Can’t wait to read your responses below…. 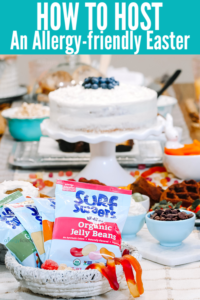 If you like this recipe & want to see more like this, simply subscribe to Xander Friendly Foods in the top box and you’ll get every new recipe directly to your inbox! Perfect for those of us who hate waiting! 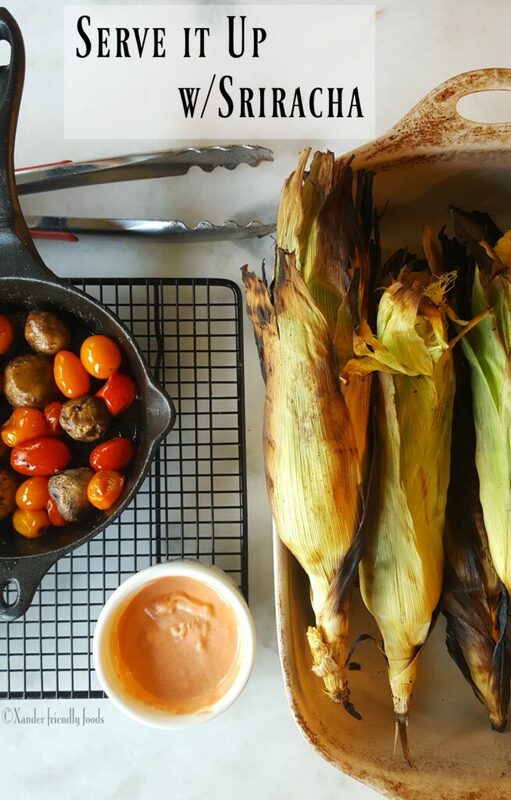 You really cannot beat grilled corn, except with delicious toppings! It sounds delicious! Thanks Jenn. Cooking it in its husks seals all the flavor in and is just so good. I hope you try it this summer. 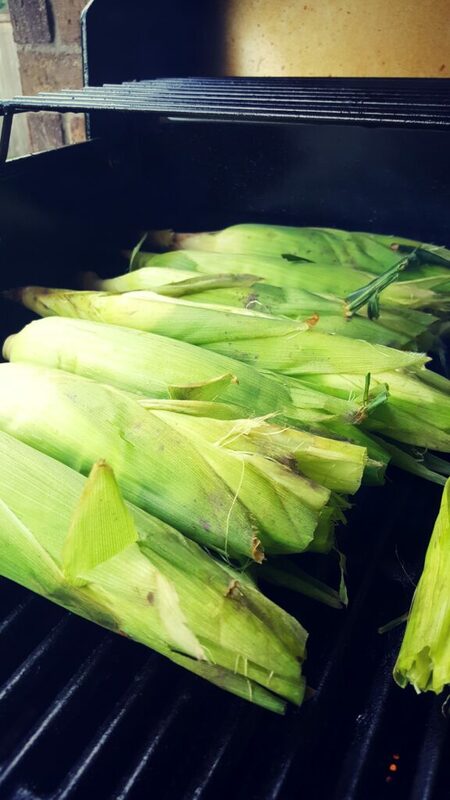 You really cannot beat freshly picked corn cooked on the grill. It is so incredibly delicious. I am loving the sound of it with sriracha mayo too! Thanks Mel. I agree, fresh corn is delicious and pairs perfectly with so many toppings. I really need to get a grill! Looks delicious! You should, just for this corn alone ;). Honestly, when I cut meat out of our diet, I thought I’d rarely use a grill, but not I do all the time with veggies. They’ve taken over and I just love all the flavors that come from grilling. You had me at sriracha! This sounds soooo good. I love grilled corn!! I never thought of sriracha on it – duh!! Ive gotta try that soon. This is how I grill corn. My mom grew up in Virginia and she taught me the technique. 🙂 I love the sriracha sauce, looks SO good! This is SO yummy! It’s funny because a few months ago we were at dinner with some friends and they were talking about how they do grilled corn and mayo all the time. So we have been doing something similar but with a sauce of mine since we aren’t big mayo fans. And of course the spicier the better! Looks delicious!! That is funny. Typically, I wouldn’t do mayo on its own, but when you spice it up, then I’m all in. I usually just enjoy corn straight up or with a little salt, but this looks like a flavor adventure worth taking. 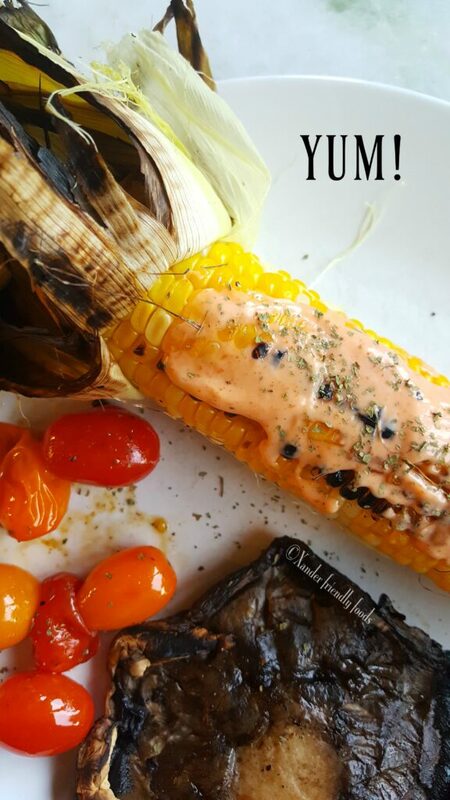 Grilled corn is such a summer fave!! Yum?! 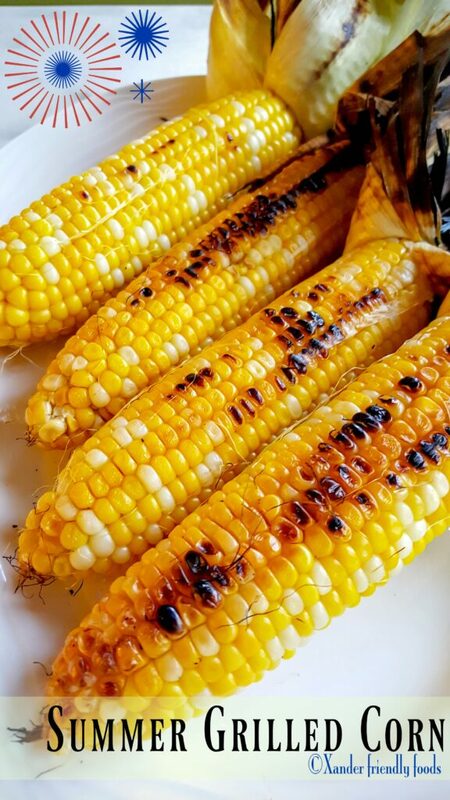 Grilled corn is such a summer fave!! Yum!!! I love it too! Always nice to change it up a bit. I learned to make grilled corn from WW. I lived in an apt. So had to settled for a cast iron grill pan. After grilling the corn, I rubbed them wth lime juice and sprinkled smoked paprika. Did not even need salt! That sounds awesome! 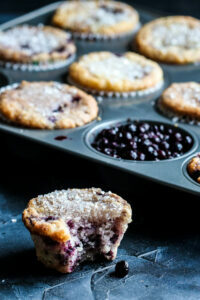 Love that you still made this with a cast iron grill pan too! Good to know for when its cold outside.